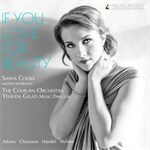 Two-time Grammy Award-winning mezzo-soprano Sasha Cooke has been called a “luminous standout” ( New York Times ) and “equal parts poise, radiance and elegant directness” ( Opera News ). Ms. Cooke is sought after by the world’s leading orchestras, opera companies, and chamber music ensembles for her versatile repertoire and commitment to new music. 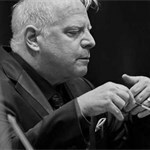 The 2019-20 season brings many returns including appearances with the Cleveland Orchestra and San Francisco Symphony with Michael Tilson Thomas respectively, Chicago Symphony under the baton of Riccardo Muti, the Netherlands Radio Philharmonic with James Gaffigan, the Philadelphia Orchestra with Yannick Nézet-Séguin, the Houston Symphony under Adrés Orozco-Estrada, Atlanta Symphony with Robert Spano and the New York Philharmonic for a tour of Mahler's 2nd Symphony under Jaap van Zweden with performances at the Barbican Centre and Concertgebouw. On the operatic stage, she appears twice with the San Francisco Opera returning to the title role in Hansel and Gretel and Laurene Jobs in Mason Bates' The (R)evolution of Steve Jobs , a role she created in 2017 at Santa Fe Opera. As a recitalist Ms. Cooke returns to The Wigmore Hall with Malcolm Martineau and is presented by the 92nd St Y and Kennedy Center's Terrace Theater alongside Julius Drake. As artist in residence with the San Francisco Symphony her work will encompass concerts with the orchestra, educational events, chamber music performances, as well as a recital in Davies Hall. Ms. Cooke has performed with opera companies worldwide including the Metropolitan Opera, Opéra National de Bordeaux, San Francisco Opera, Seattle Opera, Los Angeles Opera, Gran Teatre del Liceu, Houston Grand Opera, Dallas Opera, Santa Fe Opera, The Israeli Opera and English National Opera. A dedicated recitalist, Ms. Cooke was presented by Young Concert Artists in her widely acclaimed New York and Washington debuts at Carnegie’s Zankel Hall and the Kennedy Center. Ms. Cooke’s recordings can be found on the Hyperion, BIS, Chandos, Naxos, Bridge Records, Yarlung, GPR Records and Sono Luminus labels. Most recently she appears on five recordings including L'enfance du Christ with Sir Andrew Davis and the Melbourne Symphony on Chandos, Bates' The (R)evolution of Steve Jobs on Pentatone which won the 2019 Grammy Award for Best Opera Recording, Mahler’s 2nd Symphony with Osmo Vänskä and the Minnesota Orchestra on BIS, Berlioz’s Roméo et Juliette with Michael Tilson Thomas and the San Francisco Symphony and Sasha Cooke LIVE , a collection of her performances from the Music@Menlo chamber music festival released on their label. A devoted interpreter of new music, Ms. Cooke has premiered works b y Mark Adamo, Mason Bates, William Bolcom, Pierre Jalbert, Laura Kaminsky, Lowell Liebermann, Nico Muhly, John Musto, Marc Neikrug, Kevin Puts, Augusta Read Thomas and Joby Talbot. Next season she will premiere pieces by Jake Heggie and Michael Tilson Thomas. A graduate of Rice University and The Juilliard School, Sasha Cooke also attended the Music Academy of the West, the Aspen Music Festival, the Ravinia Festival’s Steans Music Institute, the Wolf Trap Foundation, the Marlboro Music Festival, the Metropolitan Opera’s Lindemann Young Artist Development Program, and Seattle Opera and Central City Opera’s Young Artist Training Programs. Ms. Cooke has given masterclasses throughout the United States and Canada. She lives near Houston, TX with daughters Evelyn and Julia and husband baritone Kelly Markgraf.